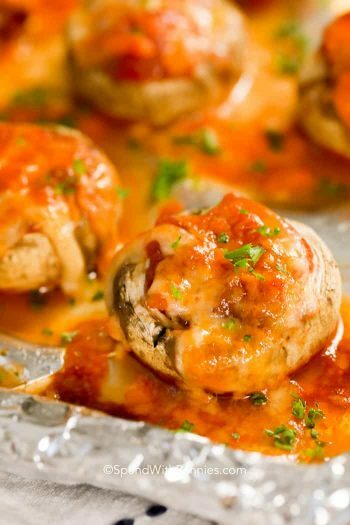 I love stuffed mushrooms… any kind. Cream cheese, cheese & bacon, crab, cheeseburger stuffed or even a simple salsa… it doesn’t matter what you put in them, it’s always the appetizer I go for first! 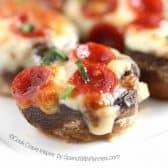 Of course these Pizza Stuffed Mushrooms top my list! Mushrooms just have such a rich earthy flavor and stuffing them is easy to do. I like to wash my mushrooms and pull out the stem, I then use a tomato/strawberry huller to make the hole a little bigger (hello! !… more filling!). I don’t always use the stems but this recipe calls for chopping the stems and cooking them with a little garlic for some extra flavor! Naturally low carb and totally huge in flavor, this is one appetizer everyone agrees on! A couple of things that make these extra yummy are using a great quality pizza sauce and adding chopped fresh basil after cooking. If you have a local Italian market, ask for suggestions for a fabulous pizza sauce! And of course fresh basil is SO amazing and makes everything taste totally incredible! 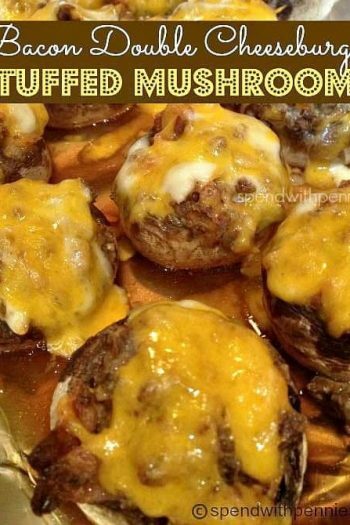 I love stuffed mushrooms… any kind. Cream cheese, cheese & bacon, crab, cheeseburger stuffed or even a simple salsa… it doesn’t matter what you put in them, it’s always the appetizer I go for first! Clean mushrooms and remove stems. Using a small spoon, scoop out insides of mushrooms to allow enough room for filling. Finely chop mushroom stems. Add olive oil, garlic and chopped mushroom stem to a pan over medium heat. Cook 5 minutes cool slightly. Stuff mushroom stems in mushroom caps. 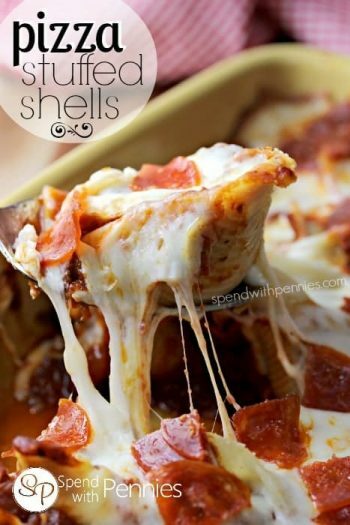 Top each with 1 tablespoon pizza sauce, 1 tablespoon cheese and 3 mini pepperonis. This is the second of your recipes I’ve made this week! This one was a smash hit, 2 adults and a 9 year old destroyed the whole batch! 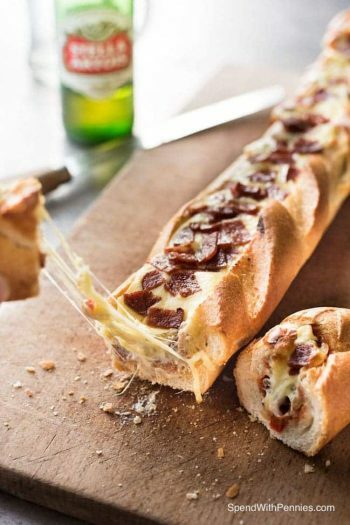 Perfect college football game day food. So glad to hear that your family loved the mushrooms Angela. Thank you for sharing! 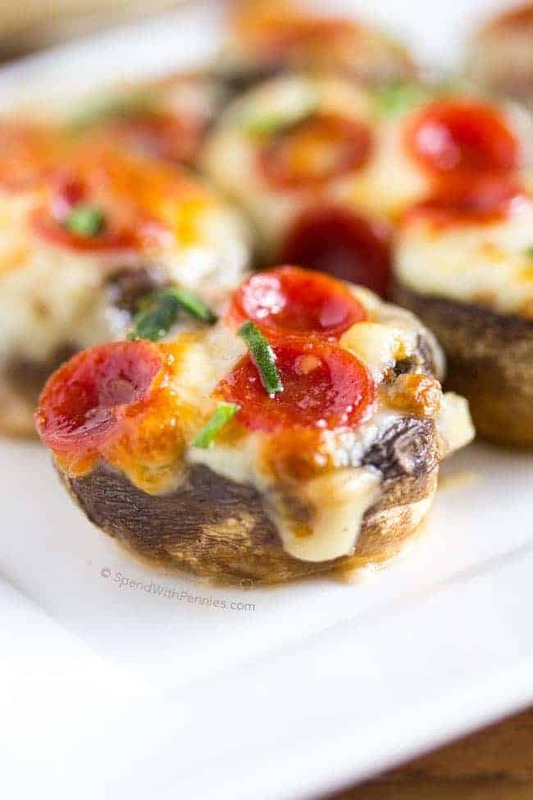 This turned out great for me, I sauted the chopped up mushroom stems with minced garlic, onion powder, salt, pepper, a few bacon pieces, and added a little pizza sauce a day ahead to save time. 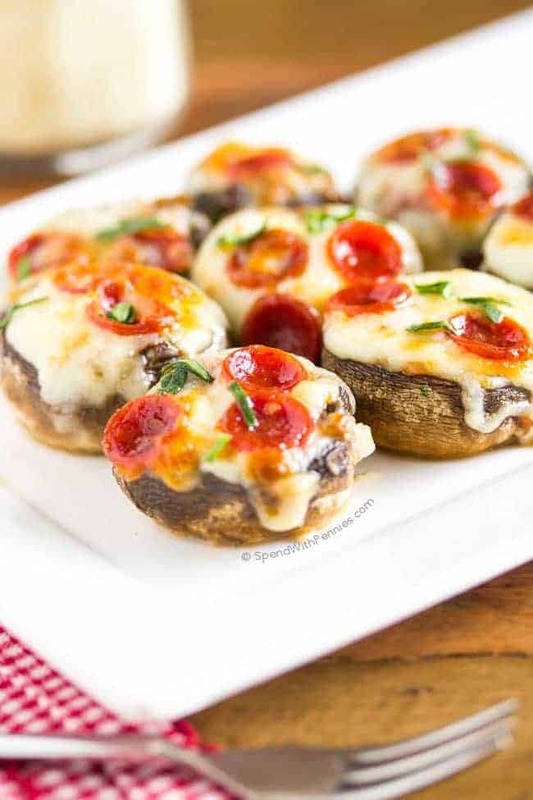 Day of my party, I microwaved to warm, put the mushroom caps on a cookie sheet, cause I was making for a crowd, put the mixture in added cheese and the pepperoni and baked, boy was it a hit!! the next day i heated up in the toaster oven and added a little tobasco and it was great for a snack! I am so glad that this recipe was a hit for your party! I like the idea of spicing it up a little with tabasco! I will have to try that! I tried this and they were great. I used Turkey sausage, spinach, sauce, topped with cheese. love your recipes. They have ingredients that I keep in my kitchen and don’t require special shopping trips but look and taste like I fussed. what kind of mushrooms do you use? and/or what size? I use white mushrooms about 1 1/2″ in diameter. Can you freeze these either before or after cooking? I haven’t tried freezing these so I can’t say for sure. This was really good, but my mushrooms leaked juice all over the place and were really messy to eat, and the juice wasn’t very appetizing. Any ideas to get them to dry out a little better? Mushrooms do naturally produce a lot of juice. 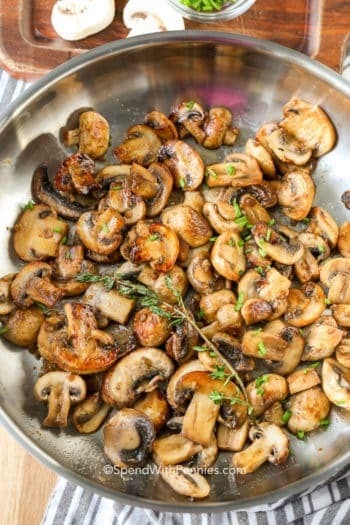 One thing you could try is partially baking the mushrooms upside down which would release some of the juices and then filling them and baking them a little bit longer (broiling them if needed). You will still get some juice. I don’t know where you live but here in Louisiana we stuff mushrooms with boudin, so darn good. Can you make this ahead of time? Yes, you can prepare them ahead of time and refrigerate. Bake just before serving. Pizza and mushroom, My family all love them both. this recipe is very good for me. I made it and invite some friends and they really like it. Thanks for sharing. Your site is very great. Usually I just bookmark a recipe. Also will be a great main dish if done with a large portobello, and a salad. :) Thank you Charlie! I agree, it would be delicious with a portobello… I think I’ll have to add that to my lunch menu this week! Pizza and mushroom, I love them both. this recipe is very good for me. I’ll try to make it and invite some friends. I hope they will love it.